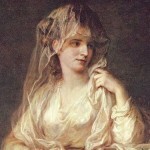 Maria Anna Angelica Katharina Kauffmann was born in Switzerland in 1741. Her childhood years were spent in Austria. Her father Joseph Johann, was a skilled painter who was his daughter’s first teacher. When handed copybooks, young Angelica copied not the letters and text but the ornamentations on the page, often with better results than the originals. By the age of 12, she was painting the portraits of bishops and other nobles. Like so many artists of her time, she spent several years in Italy honing her craft. Lady Wentworth, the wife of the ambassador, accompanied Angelica to London and provided the talented artist with an introduction into society. Her talent for painting, languages, singing and her personal charm made her a favorite among the royal family. She fought for the establishment of the Royal Academy of Painting and Sculpture and was one of two woman artists honored in the first catalog in 1769. Much of Kauffmann’s work was in the area of history painting – one of the most lucrative and elite disciplines in academic painting. The English had not fully embraced history painting and she returned to the European continent to ply her trade. Kauffmann met Johann Wolfgang von Goethe in Rome. 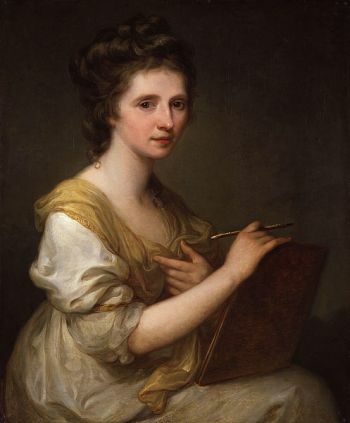 In a letter to his native Germany, he said of her, “Her works are the outcome of a lovely imagination, a pure soul- for the rest, she is mistress of her pencil, excels in colouring, which is much appreciated here.” In Angelica Kauffmann: a biography, Francis A. Gerard shares passages from Goethe’s letters that make it clear that Angelica provided both inspiration and editorial suggestions to the famous writer. 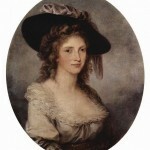 Along with her paintings, Angelica Kauffmann created a number of fine etchings. Between 1771 and 1781, she painted ceilings, friezes and other decorations in some of the finest houses in Rome. Angelica used both one and two n’s in her last name during her career but eventually settled on using just one. Kauffmann married the Italian artist Antonio Zucchi in 1781 and the couple made their home in Rome until his death in 1795. Her work continued to appear in the Academy’s catalog until 1797. During the last ten years of her life, she produced few works. Angelica Kauffman died in Rome in 1807 where the entire Accademia di San Luca (an association of artists in Rome) escorted her to her tomb and two of her best pictures were part of the procession.